A few months ago, my sister sent me a newspaper clipping about knitted home decor, including a teacosy with MORE TEA, VICAR? on one side. 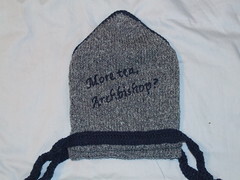 She volunteers at York Minster, and joked that she should have one with, 'More tea, Archbishop?' on it. That set me thinking. I made it more or less the shape of a bishop's mitre, and turned a slight problem into a resounding success by deciding to put ties in the bittom instead of sewing it up. This was actually because I wasn't sure of the size of her teapot, but they ended up looking like the bands at the base of a mitre. I love it when a plan comes together. Especially when it's accidental. I made the two sides separately, and made a diamond-shaped section in contrasting yarn (the one I used for the ties and embroidery) to go between the two pieces at the points. I fixed the points shut with a press stud, so that, if she wants to use it with a tall coffee pot, she can undo the press stud and have extra height if she needs it. The embroidery was much simpler than I had feared it would be. I typed the phrase into my word-processing package, tried different fonts and sizes till I liked the look of it, then printed it off onto ordinary paper. Then I followed the instructions in this article. I had to fill in one or two stitches when I removed the paper, but by and large it worked extremely well. 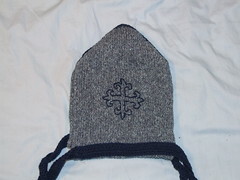 It was a surprisingly quick make, and now I'm about to make another for a friend - whose surname is Bishop! I've never been able to embroider on knitting without puckering the material or reducing its stretchability - so I have to incorporate text into the fabric as if it were Fairisle. This can be fun - or a pain - so congratulations on your sewing skills as well as your knitting and design ones. You are SO creative! I bet if I asked for a bookshelf cover you'd come up with something too amazing for words!